Christ Church was built in 1846 and is situated in Christchurch Lane, just off the Walsall Road in south western Lichfield. It stands serenely in a most beautiful and peaceful churchyard having a very village-like feel to it, in this quiet corner of the small but very bustling city of Lichfield. It is built of sandstone quarried in Lichfield and designed by a Lichfield architect, Thomas Johnson, who was responsible for much building and renovation work in and around the Diocese of Lichfield. The church’s architectural style is known as Victorian Gothic Revival, which is evidenced by the shape and decoration of the windows and by the tower which is decorated below and perpendicular above. 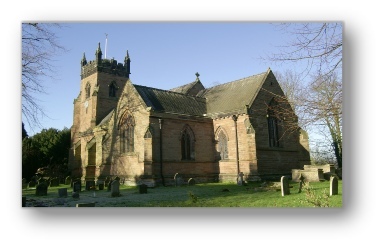 The church was consecrated on 26th October 1847 by the then Bishop of Lichfield, the Right Reverend John Lonsdale. The first incumbent was the Revd Thomas Alfred Bangham. The church was built and endowed by the generosity of Ellen Jane Hinckley, the daughter of John Chappel Woodhouse, sometime Dean of Lichfield. In 1835 she married her third husband, Richard Hinckley, a Lichfield solicitor and they lived in a mansion named Beacon Place. Ellen had suffered tragic family losses. By her first marriage to the Revd William Robinson, she had two daughters, both of whom died in childhood. These two children are the subject of the memorial known as Chantrys ‘Sleeping Children’ in Lichfield Cathedral. The church was built in the corner of the park which surrounded Beacon Place and originally consisted of only the nave and chancel, the north and south transepts being added in 1887 when one Samuel Lipscombe Seckham bore the cost of the north transept. Because there was no parish, one was created especially. This was done by annexing parts of the parishes of St Michael and St Chad. To commemorate the first fifty years of the church, the decoration of the chancel ceiling and walls was commissioned by the then vicar and churchwardens, the cost being met by public subscription. The artist was John Dixon Batten, who created the beautiful and unique ceiling paintings. They set forth Jesus as the promised and hoped for Christ and Holy Communion as the Christian’s means of union with Him. The reredos and marble sanctuary floor was presented in 1906 by Thomas Cox, a churchwarden and his daughters in memory of Sarah Cox, wife and mother. It was designed by G F Bodley who also designed the high altar for St Paul’s Cathedral and built by Robert Bridgeman and Son of Lichfield. Over the decades, the church has been very fortunate to have been richly endowed with many treasures and more practical items such as a modern heating system due to the generosity of a number of local benefactors. The church founded an adjacent school in 1847, which was replaced by the current school in 1910 and extended in 2001. The school and church maintain close links to this day.